For the first time, the top 100 richest tycoons in India are all billionaires, according to the latest Forbes rich list. 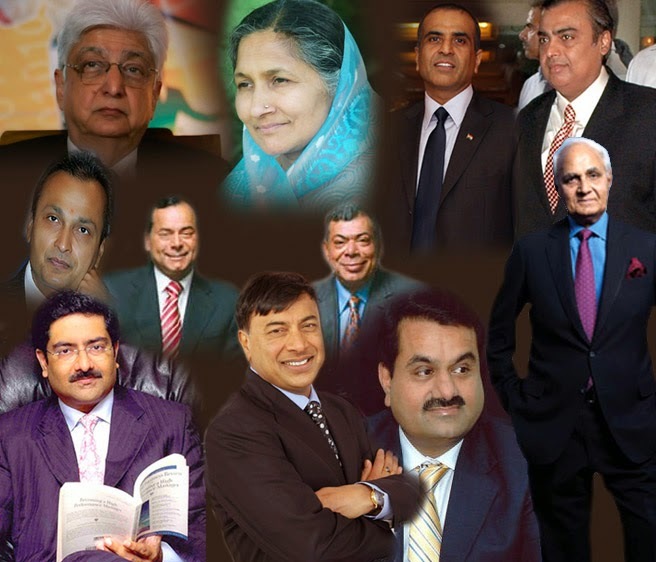 The combined net worth of India’s 100 wealthiest is US$346 billion, up more than a third from $259 billion in 2013. 1) Mukesh Ambani; US$23.6 billion 2) Dilip Shanghvi; $18 billion 3) Azim Premji; $16.4 billion 4) Pallonji Mistry; $15.9 billion 5) Lakshmi Mittal; $15.8 billion 6) Hinduja brothers; $13.3 billion 7) Shiv Nadar; $12.5 billion 8) Godrej family; $11.6 billion 9) Kumar Birla; $9.2 billion 10) Sunil Mittal; $7.8 billion Read More..